The year 2008 ended with the 84th edition of the Sao Silvestre de Sao Paulo (more) in Brazil on 31 December, over 15km. The elite women set off before the men and the mass field with women's winner Yimer Wude Ayalew romping away to a clear win ahead of all the men. Equally commanding in the men's race was James Kipsang, recent winner of the Pampulha Lagoon race (17.8km) in Belo Horizonte, ahead of the favourite Evans Cheruiyot. Only 5 hours into 2009 the AIMS programme kicked off with the 7th St Croix International Marathon (more) in the US Virgin Islands on 1 January. Runners departed in the dark, and welcomed the first dawn of the New Year one hour into the race. Haile Gebrselassie captured his 25th world record and second world marathon record in Berlin on 28 September, surpassing the 2:04:26 mark that he set in last year's race by 27 seconds. From the beginning he was on track for a new record, assisted by four pacemakers and a couple of genuine competitors, Charles Kamathi and James Kwambai. This group was clear from 5km, and on record schedule throughout, as the pacemakers peeled off at 21km, 25km, 30km and 31km. Kamathi dropped back before 32km but the surprising Kwambai stayed at the world record holder's shoulder all the way down the Kufurstendamm as they passed 36km together. Gebrselassie then changed gear, and left the valiant Kwambai in his wake. Kwambai had been supposed to push Gebrselassie in last year's race, but contracted malaria just before the race. His personal best of 2:10:20 was due for drastic revision, and he completed in 2:05:36. Gebrselassie pressed on through, consistently on course for a time around 2:04. As he passed through the Brandenburg Gate with 390m to run, he could see exactly what he had to do. And then he did it. Irina Mikitenko won the women's race with a new German national record of 2:19:19. In the 35th edition of the real,- Berlin Marathon (more) on 28 September, Haile Gebrselassie set a new world record of 2:03:59. He broke his own record set in the same race the previous year (see News item above). Irina Mikitenko broke the German national record with 2:19:19. Elsewhere in Europe the Lake Garda Marathon was run along the shores of the scenic Italian lake while the 4th edition of the Geneva Marathon (more) was held in a comparable setting in Switzerland. The Marathon Expo Zaragoza took place in north east Spain. To match the four marathons there were four half marathons, including the 47th edition of the venerable Route du Vin Half Marathon (more) in Luxembourg. In Italy the Maratonina di Udine (more) got back to its normal schedule after hosting the World Half Marathon Championships last year and the Turin Half Marathon (more) took place. The 9th edition of the RTP Half Marathon of Portugal (more) was run across the Vasco da Gama Bridge in Lisbon. The oldest race of the weekend was the Fortis Singelloop Utrecht 10km (more), run alongside the canals of the Dutch town for the 58th time. Over in North America water continued to be the theme of the day, with the Marathon by the Sea (more) being run in St John, New Brunswick and the Scotiabank Toronto Waterfront Marathon (more) further west into Canada. Below the 49th parallel the Lake Tahoe Marathon (more) brought a week of running events there to a close, while the 10km Internacional Costa Rica was held in the country's capital city, San Jose. 25 Sept: A strong group of strong Kenyans will run the 27th Dresdner Kleinwort Frankfurt Marathon on 26 October, including William Kiplagat and Benjamin Maiyo, with personal bests of 2:06:50 and 2:07:09. Kiplagat will be the fastest runner ever to start the race. Although his best time dates from 1999, he won the Rotterdam Marathon in 2003 in 2:07:42. This is just slightly faster than Wilfred Kigen's course record of 2:07:58, set a year ago, and ?95000 is on offer for anyone going sub-2:07. Ben Maiyo could also be that person. Still looking for his first major marathon win, he finished second in Chicago in 2005, and second again in Boston six months later (2:08:21). Sammy Kurgat returns to contest the Frankfurt race again after finishing third last year in a personal best of 2:08:38. In the women’s race defending champion Melanie Kraus returns, but it looks like there is no one who can prevent the Kenyan men retaining their stranglehold on a title that they have won for the last six years. Entries for the Dresdner Kleinwort Frankfurt Marathon suggest that the race will see a record field of about 12,500 marathon runners, about 10% up on last year. Adding in all the other running events the total field could well reach 20,000 for the first time. Entries for the race are still possible. For more information and online registration visit: www.frankfurt-marathon.com. 22 Sept: The second annual AIMS Marathon Symposium will be held in the town of Marathon, Greece, on 8 November, the day before the Athens Classic Marathon is run on the traditional course from Marathon to Athens. 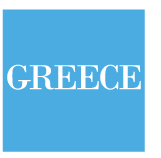 The Symposium, also backed by the IAAF and SEGAS, the Greek federation, was inaugurated last year by a new management committee for the Athens Classic Marathon, to upgrade the race to the status that its history deserves. The organisers have also arranged for a Marathon Flame, similar to the Olympic torch to be delivered around the world, something that several other major city races have already enjoyed. Marathon has become such a common word in most languages that its origins are not always obvious. It was in a field outside the then village of Marathon, some 36km from Athens, that a famous battle was won by the Athenians against the Persians in 490BC. Legend has it that a messenger named Phillipides ran across the Peloponnese for help, then brought news of victory to Athens. He allegedly died after blurting out, ‘Rejoice, victory is ours”. When the inaugural Olympic Games were held in Athens 1896 the marathon race was born out of this legend. The theme of this year’s Symposium, to be opened by the Mayor of Marathon and the Deputy Minister for the Interior, will be ‘Adding Value To Your Marathon’. Last year’s inaugural symposium was attended by marathon luminaries such as double Marathon World Champion Abel Anton of Spain and Rosa Mota, winner of the first women’s championship marathon, the 1982 European Championship in Athens. The symposium attracted representatives from over 30 international marathons from around the globe. In Europe, the Dam tot Damloop (more) from central Amsterdam to Zaandam on a course of 16.0934km (10 miles) was won by Sammy Kitwara (45:17) and Peninah Arusei (51:22). Further to the north the Hans Christian Andersen Marathon (more) in the Danish City of Odense (the famous author's birthplace) was run over a two-lap course with separate women-only half marathon over a single lap. Across the Atlantic, still on 21 September, Marathon by the Sea takes place in St John, New Brunswick (CAN). Further south the long-established (29 years) Maraton Leon Independencia (more) once again hit the streets of Leon, 200km north-east of Mexico City. Way down south in Argentina the Buenos Aires City Half Marathon (more) celebrated its 20th birthday. Past Medtronic Twin Cities Marathon champion and Olympian Dan Browne heads the field in the race on 5 October, along with five others who finished in the top 21 positions at the US Olympic trial last November. Also in the field is Fernado Cabada, the American 25km record holder and Justin Young, who lowered his personal best by over five minutes to 2:13:54 in the Rotterdam Marathon in April. In the women’s race Mary Akor could become the first woman to win Grandma’s Marathon and Medtronic Twin Cities Marathon in the same year, but faces stiff opposition from sub-2:30 runner Silvia Skvortsova (RUS) and Olga Glok (RUS) who ran 2:30:40 in Paris this year. For the 18th consecutive year, the Medtronic Twin Cities Marathon will host the US Masters Championship. Susan Loken of Phoenix is the three-time defending champion on the women’s side. 2007 US Masters Champion Tracy Lokken also returns to defend his title. 18 Sept: The first edition of the French Riviera Marathon des Alpes Maritimes Nice-Cannes, due to be run on 9 November, has already reached its limit of 10,000 runners. The organisers regret that many runners will be disappointed, as there will be no further registrations for this year's inaugural event. The chosen 10,000 will line up on the famous Promenade des Anglais in Nice at 08.45 on 9 November and enjoy a coastal route which takes them past all the most scenic spots on the French Riviera before finishing at the Palais des Festivals in Cannes. Runners pass through seven beautiful towns of the French Riviera: after departing Nice, Saint-Laurent-du-Var and its harbour, Cagnes-sur-Mer and its seaside, Villeneuve-Loubet and its marina, Antibes Juan-les-Pins and its pinewood, Vallauris Golfe-Juan and its craft and cultural villages and, last but not least, Cannes and its famous Croisette. From Thursday, 6 November at 14.00, the party will be in full swing with the official opening of the Marathon expo located on the Promenade des Anglais, just two blocks from the Place Masséna. Rabobank, a Dutch Institution which has for decades been a major name in world cycling, is back as a major sponsor of the Big Sur Half Marathon on Monterey Bay, to be held on 9 November. In California the bank is community-focused, and mid-sized, providing a full range of services to individual, business and agricultural clients. Both at home and abroad the bank is a strong community partner. Regional President of Rabobank Harry Wardwell says: "The Half Marathon is a great event for our community and our organization, and we are proud to have been an official sponsor from the beginning." In the geographic heart of Russia, the Novosibirsk Half Marathon (more) was run on 13 September, followed by the Vilnius Marathon (more) in the Lithuanian capital and the Ruskamarathon (more) in Kiittila, Finland, in both of which home runners took the top spots in men's and women's races. Action started in the same area the next day, with the Moscow Peace Marathon (more) in the Russian capital and the Wroclaw Marathon (more) in Poland. Elsewhere in Europe the Wachau Marathon was run along a beautiful stretch of the Danube River in Austria and the Reebok Bristol Half Marathon (more) took place in Great Britain. Over the Atlantic the Medio Marathon de Medellin (more) was run in the Colombian city, and the Maui Marathon and Half Marathon (more) in the Hawaiian Islands rounded off the weekend's action. In an area where there has been intense diplomatic activity for a couple of decades, a special race is being held to keep envoys on their toes. Within the 16th International Novi Sad NIS Marathon to be held in the Serbian town on 12 October there is a diplomatic relay race run over the marathon distance. For further information see www.maraton.org.yu or phone +38121 527214. On 6 September the Swiss mountain classic Jungfrau Marathon (more) was held in its popular and picturesque Alpine setting, with Italy's Hermann Achmeuller and Hungary's Simone Staicu coming out on top. Later on in the day Henrik Skkog (1:04:41) and Anna Rahm (1:13:56) took the honours in the Stockholm Half Marathon (more). Half marathons dominated on 7 September, with the Pila International Half Marathon (more) in Poland, the Nike Budapest Half Marathon (more) acting as a warm-up for the marathon there a month later, the Great Scottish Run (more) being held in Glasgow and the Medio Maraton Atlas de Guadalajara (more) taking place in Mexico's second city. The only marathon of the day was the Torshavn Marathon (more), held in the Faroe Islands in the North Atlantic. Two former winners will fight it out in the 33rd edition of the ING Amsterdam Marathon on 19 October. Robert Cheboror was surprise winner in 2004 in a new personal best of 2:06:33, while Solomon Bushendich - at 24, five years junior to Cheborbor - won in 2006 on his marathon debut in 2:08:52, which remains his personal best. Last year less then a second kept Paul Kirui off the podium in Amsterdam with his time of 2:07:12. World Half Marathon Champion from 2004, he has a marathon best of 2:06:44, and returns to Amsterdam this year. 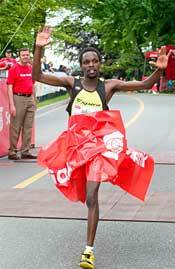 A fourth top elite runner, 34-year old Benjamin Limo, will make his marathon debut in this year's race. Limo became World Champion at 5000m in Helsinki in 2005. The Ruta de las Iglesias 10km (more) was run in the streets of Quito in the evening of 30 August, past the torch lit facades of the Ecuadorean capital's main churches. Miguel Condor and Diana Landi won in altitude-affected times (2800m) of 31:27 and 36:31 respectively. The Hokkaido Marathon (more) was held next day on Japan's northernmost island. The 25th anniversary Glitnir Reykjavik Marathon (more) took place in Iceland on 23 August, coinciding with the country's "culture night" and forming part of the myriad entertainment possibilities on offer. Next day. at 07.30 on 24 August, the Men's Marathon of the XXIX Olympiad (more) was run in Beijing. Later that day, the Victoria Falls Marathon was held on the Zimbabwe side of the Zambezi River. To finish off the day's action the SSQ Quebec City Marathon (more) took place in Canada, with a changed route over the first 10km of the course. 24 August: Samuel Wanjiru, world record holder at the half marathon, went the full distance in Beijing to win Kenya´s first ever Olympic gold medal in the Marathon, and in the process break Carlos Lopes´s 24-year old Olympic record by nearly three minutes. Ethiopia´s Deribe Merga contributed to the fast pace by taking up the running on the few occasions that Wanjiru was content to take a back seat. But after Wanjiru´s decisive break in the 37th kilometre he fell back as Morocco´s Jaouad Gharib made an attempt to chase Wanjiru. Photo - Getty Images Deribe agonisingly lost what would have been a deserved medal in the back straight of the stadium, as his compatriot Tsegay Kebede came past him. Wanjiru made his intentions clear from the start, by taking the lead in the first kilometre and setting a fast pace (14:42 at 5km) However, the second 5km split was a phenomenal 14:33, and reduced the group from a couple of dozen to 10. Wanjiru only partly made the running in the earlier stages, but at 15km made his first definite move and reduced the group to seven and by 18km to five: Wanjiru, Merga, Gharib, Eritrea´s Yonas Kifle and Wanjiru´s team mate Martin Lel. At halfway (1:02:34) they were 10 seconds ahead of the World Champion Luke Kibet, with Kebede a further 13 seconds behind, keeping company with EritreaC2s Yared Asmerom. Merga was doing much of the leading in the middle of the race, and at 28km his injection of pace dropped Kifle and Lel. Gharib also lost distance, but gradually worked his way back past the other two to rejoin the leading pair. The pace continued fast, but without change until Wanjiru kicked hard a little past 36km. Gharib responded but seemed as interested in looking back to the trailing Merga as forward to Wanjiru. By 38km Wanjiru was six seconds clear, and the margin grew relentlessly as he pressed on to the stadium, bursting onto the track in fine style. His last 400m doubled as a lap of honour, but after crossing the finish line his celebrations were muted until he had offered his own congratulations to Gharib. For full story <click here>. 17 August: Romania's Constantina Tomescu gambled with a decisive injection of pace at the halfway point of the women's Olympic Marathon and built up a lead of well over a minute in the next 17km. The following pack slimmed down to six at 36km before the gap started to close, and by that time individual efforts from among them could only capture silver. As a jubilant Tomescu celebrated as she crossed the line the experienced Kenyan Catherine Ndereba surged past home favourite Chunxiu Zhao in the final straight, 22 seconds behind the victor. In the meandering route from the start in Tiananmen Square a trail of casualties were left in Tomescu's wake. Deena Kastor, with a bronze from Athens, forfeited at 5km with a foot injury. Liz Yelling took a heavy tumble before halfway and fellow Briton Paula Radcliffe's lack of race fitness inevitably caught up with her even before any attempt to chase down Tomescu took shape. Tomescu's now trademark early break elicited little response, with Ndereba in particular content to spectate from the back of the pack. Even after she moved forward at 35km the chase did not begin. Tomescu was still going away up to 38km, and at 40km remained a minute clear of the now chasing group of four: Ndereba, Zhao, Xiaolin Zhu and Martha Komu. Komu, visibly straining, did most of the donkey work in the final stages, but the final duel for silver and bronze - it never looked likely to be more than that - was always likely to be between Ndereba and Zhao. For full report <click here>. The Helsinki City Marathon (more) took place in the Finnish capital at 15.00 on 16 August, offering kind conditions (17C) to a multinational field in this second largest marathon in Scandinavia. It is 56 years since the Olympic Games were held in Helsinki, but 10 hours later, at 07.30 on 17 August, the Women's Marathon of the XXIX Olympiad was due to start in Beijing (see separate story). Later on in the same day in the Western Hemisphere and many time zones later, the Maraton de la Ciudad de Mexico was held at another past Olympic venue, and further north the day's action rounded off with the ING Edmonton Marathon (more) in Canada. Henry Jaen defended his title in the XXXII Panama City International Marathon (more) on 10 August, running 22 seconds faster than he did last year. Compatriot Yailen Garcia won the women's race, maintaining Cuba's outstanding record at this event. The race started and finished in the National Stadium and took in the city Centre, the esplanade alongside the Panama Canal and the sights of Old Panama. With entries for the Medtronic Twin Cities Marathon now closed, efforts have turned to recruiting active participation from spectators. ING and Twin Cities Marathon, Inc. are continuing the official ING Neighborhood Cheer Zone contest, offering cash awards for neighborhood schools, non-profit associations or recreation/community centers. The contest is a way to recognize the neighborhoods that come out to support the participants each year. "Energy and enthusiasm from the community helps to make a marathon successful,” said Mike Emerson, President, ING Reinsurance. To create an Official Cheer Zone, register for free by 10 September. Each zone will be given a starter kit with thunder sticks, spectator guides and decorating ideas. Official cheer zones will be judged on creativity and enthusiasm. Cash prizes of $750, $500 and $250 will be awarded to the top three zones. Prize money will be donated to a non-profit neighborhood association, recreation or school of the winners’ choice. A fourth prize, recognizing a contest created by kids will be added to this year’s awards. Visit www.mtcmarathon.com for more details. 5 August: The 33rd Marine Corps Marathon on 26 October sold out in five days when entries opened in May, but there is still a way that runners can gain entry. The Siberian International Marathon took place on 2 August over a two-lap course along the banks of the River Irtyish in the Western Siberian city of Omsk. Next day, and 13 time zones further west in San Francisco (more), runners had their annual opportunity to cross the Golden Gate Bridge. The full marathon runners were kept company by two separate half marathon races. 4 August: When over 19,000 entrants ran the San Francisco Marathon and its companion two half marathons and 5km on 3 August four members of the U.S. military had already covered the distance "remotely" two days earlier at Forward Operating Base Fiaz in Asadabad, Afghanistan. One of them, Lieutenant Colonel Weeks (43) had the San Francisco Marathon in his plans since starting to compete in marathons last year while he was stationed in California. His military schedule didn't seem to allow him the opportunity, but he registered for the San Francisco Marathon, contacted the race organizers, and arranged to run the race "remotely." He put the word out to other U.S. military posts in Afghanistan about his planned run, and invited others along. Two U.S. Army soldiers took up the offer along with U.S. Navy man John Rousseau of Illinois. Two AIMS events took place on consecutive days, 26 and 27 July, separated by ten thousand kilometres, but at the same distance from sea level: 2600m. The Swiss Alpine (more) is the biggest mountain ultramarathon in the world. (ABOVE: Swiss Alpine view.) Sweden's Jonas Buud retained his title in just over six hours, 2.5 minutes faster than last year and 16 minutes ahead of the local Swiss specialists. However, local mother of two Jasmine Nunige surprisingly beat last year's winner Elizabeth Hawker (who ran 25 minutes slower than her winning time of last year) by an impressive 10-minute margin. Next day Kenyan men and women took the first three places the Media Maraton de Bogota (more) next day in the more urban environment of the Colombian capital - but also 2600m above sea level. Isaac Macharia and Pamela Chepchumba had assured wins with times of 1:03:34 and 1:12:55 respectively. In the Great Tibetan Marathon & Half Marathon (more), that was held on 19 July, runners were on top of the World, on the Tibetan plateau in the peaceful area of Ladakh. Maricruz Lopez from Mexico took the overall lead on the early steep descent, but as the route flattened out Trausti Valdimarsson from Iceland took over. He went on to win but Maricruz Lopez dominated the women's race. 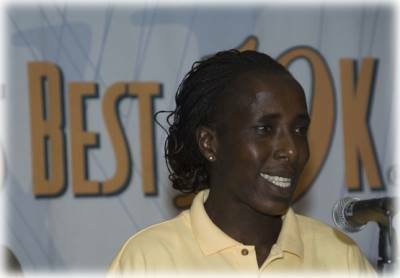 5 July: Lornah Kiplagat received two awards at the Cavendish Hotel, London, prior to her participation in the British 10K. The AIMS/ASICS Golden Shoe award, announcing her as World Athlete of the Year, an accolade from the 248 AIMS member race organisations in over 80 countries. 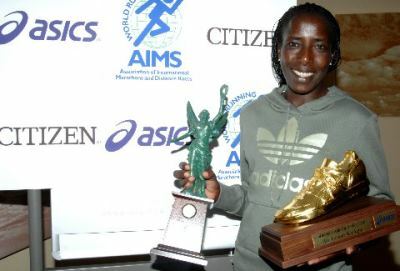 Lornah also received the AIMS/Citizen World's Fastest Time award to mark her half marathon performance of 1:06:25 recorded in Udine (ITA) last year on 14 October 2007 which has since been recognised as the new world record for the distance. Lornah Kiplagat said "I very much appreciate these awards. It is an honour that so many people in the distance running world voted for me. I want to also say a special thank you to AIMS, ASICS and Citizen." Two marathons were due to take place in Europe on 5 July, but the Tallinn Marathon (more) in the Estonian Capital was cancelled. The race organisers comment: "For second year in row Tallinn city administration and the police is against Tallinn Marathon. The security requirements exceed material and physical capacity of the marathon organisation." An alternative 10-11 km run was held over two laps in the Pirita forest, and started at 17.00 from the Pirita cycle track." Elsewhere, the Zermatt Marathon (more) took place in the Swiss Alps. Runners also departed from Europe to travel to Namibia to run the 100km of the Namib Desert (more). This event consists of a stage of 18km on 7 July and then 20km, 42km and 26km on the following days 8, 9 and 10 July. On 6 July the Gold Coast Airport Marathon (more) in Queensland, Australia attracted record participation. 21,000 runners from 29 countries took part in the full programme of events, with nearly 4000 in the Marathon. Seventeen time zones later the HSBC Calgary Marathon (more) was run in Alberta, Canada. One race above all came to define the marathon. A hundred years ago, on 24 July 1908, the Marathon run within the programme of the IV Olympic Games in London eventually led to all marathons becoming a fixed length of 26 miles and 385 yards, or 42,195m. Up until that time marathons had only been around for 12 years, the distance had been based on that between Marathon and Athens, about 40km, but was not fixed and could vary considerably depending upon the whim of the organiser. 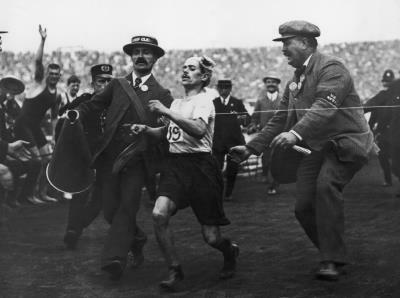 The marathon race in the 1908 Olympic Games in London changed all that. It unfolded with such drama and so many further consequences that the distance almost haphazardly arrived at in that race became the standard. It was immediately adopted for re-matches between the same leading players over the next few years -S to settle bets on the outcome - and when the amateur authorities that governed the sport came to make a ruling 15 years later, they could not ignore what had become lodged in the public mind as the defining moment of the event. <read more>. All races will begin simultaneously at 05.15 and will follow the same course. Runners and walkers who are participating in the 10K will turn around at the six mile mark, after they have passed the Long Bay Beach Park. Greg Johnson, staff writer for the Los Angeles Times reports that the Los Angeles Marathon will be sold to an investor group led by L.A. businessmen David Kingsdale and Russ Pillar. Chicago-based Devine Racing Management's need to raise funds is driving the sale. "The new folks have a good opportunity," said Chris Devine. "They're going to really capitalize the race and take advantage of this situation." Kingsdale declined to comment on the deal, saying only that "we look forward to completing a transaction in the near future." It is unclear whether LA Marathon founders Bill Burke and Marie Patrick will be involved after the sale. Burke and Patrick had retained management roles after Devine bought rights to the race in 2004. Any sale of the operating rights must be approved by the city, which owns the race. 1 July: In a first for the event, the Gold Coast Airport Marathon will be webcast live to millions of homes around the world from 06.00 to 14.00 (local time) on 6 July at www.goldcoastmarathon.com.au . The webcast will feature guest interviews with Marathon greats Rob de Castella and Steve Moneghetti, and former race winners Brad Camp, Pat Carroll, Lee Troop, Samantha Hughes and Rod de Highden. The Marathon will also be telecast nationally on Saturday 20 September at 12.00 as a one-hour highlights package. For pay television subscribers, Fox Sports will feature a one-hour program on 5, 7, 10 and 11 August and the race will also be featured on major Asian network ESPN Star Sports for the first time, available to more than 100 million subscribers between 28-31 August. A number of Japanese broadcasters will fly out for the Gold Coast Airport Marathon this week to showcase the event to millions of Japanese viewers. National broadcaster TBS has a production team of 34 working at the event, which will follow the progress of celebrity Kunihiro Matsumura as he endeavours to complete his second Gold Coast Airport Marathon. BS Nihon TV, Nihon TV and Yomiuri TV will also feature stories on the Gold Coast Airport Marathon focused on the participation of famous Japanese wife and husband comedians Hanako and Daisuke. One-hour documentaries will feature on BS Nihon TV and Nihon TV on 8 and 15 November. Television personality Rie Hasegawa is also producing a DVD on ‘how to run a marathon’ with a dedicated crew on the Gold Coast to shoot the vision of Ms Hasegawa running in the event. Gold Coast Airport Marathon General Manager Cameron Hart said this would be the event’s widest national and international coverage ever. Two marathons were held in Finland on 28 June - the Paavo Nurmi Marathon (more) in Turku and the Santa Claus Marathon (more) in Rovaniemi, which involves crossing the Arctic Circle. On the same day the Vidovdan 10km (more) was held in Brcko, Bosnia on a multi-lap course around the town square. Above: Vidovdan 10km, The elite athletes may have been the main feature but 5000 children participating in a series of races from 400m to 5km were the highlight. The Rio de Janeiro Marathon (more) was held on 29 June. The Midnight Sun Marathon (more) took place on the summer solstice, 21 June, in Tromso at 70degN in northern Norway. 500 people from 45 countries started the Marathon at 20.30 with most runners finishing after midnight - still in broad daylight. First in were Samwel Chepno (KEN) in 2:23:14 and Mona Rydland (NOR) - just before midnight - in 3:17:51. A few hours later on 22 June the Lake Saroma 100km race was held in Hokkaido, northern Japan. In the western hemisphere, and many hours later, the Marathon de Quito (more) was run in the high altitude (2800m) of the Ecuadorean capital and the Tangamanga Marathon (more) took place in San Luis Potosi in Mexico. Rounding off the day's action was the Scotiabank Vancouver Half Marathon (more) on the western seaboard of Canada, won by Kenyans Moses Macharia in 1:04:50 and Florence.Jepkosgei in 1:14:04. The French Riviera Marathon des Alpes-Maritimes Nice-Cannes promises a spectacular debut on 9 November 2008. With 140 days still to go, 7000 runners have entered. The race offers an extraordinary route (flat, coastal with beautiful views of the Mediterranean Sea) and a scenic tour of the seven most beautiful settlements along the French Riviera : Nice and the start of the race on the Promenade des Anglais, Saint-Laurent-du-Var, Cagnes-sur-Mer, Villeneuve-Loubet, Antibes Juan-les-Pins, Vallauris Golfe-Juan and Cannes, with the finish line in front of the famous Palais des Festivals et des Congrès. 17 June: The Baxters Loch Ness Marathon and Festival of Running adds the Healthy Working Lives 10K Corporate Challenge to its programme on 5 October this year. Sponsored by The Scottish Centre for Healthy Working Lives, it is open to all sectors of business and industry across Scotland. The winning company will be awarded a specially commissioned Healthy Working Lives trophy. The aim is to promote regular physical activity within the workplace by offering a new team challenge. Race director Malcolm Sutherland said: "By offering a focus for teams we hope to encourage people in all kinds of jobs to get active and to compete in the Challenge. " Teams must comprise a minimum of four and a maximum of six employees from a single organisation or employer. More than one team may be entered by any one organisation or employer. Prizes will be awarded for the fastest team overall, as well as the fastest team from each of the public and private sectors. The Baxters River Ness 10K route followed by participants in the Healthy Working Lives 10K Corporate Challenge takes competitors from the start on the south-side of the historic Highland capital of Inverness, past the Castle and along the banks of the picturesque River Ness to finish in Queens Park Stadium. The Festival of Running also incorporates the Baxters Loch Ness Marathon and the Baxters River Ness 5K Fun Run, with all three events finishing in the same arena. 17 June: Participation figures for this year's Gold Coast Airport Marathon have already sprinted past last year's record total of 16,172 with 19 days still to go until race day. A new record of 18,000 entries is well within reach for the 30th anniversary event to be held on 6 July. With 65% of runners in the five events of the Marathon festival coming from outside the Gold Coast, the event will be a significant tourism injection for the area. Queensland Events Gold Coast has worked in collaboration with Tourism Australia, Tourism Queensland, Gold Coast Tourism and Gold Coast Airport to market the event in key international and domestic markets. Domestically, close to 2,400 entries have come from New South Wales (up 20%), nearly 700 from Victoria (up 40%) and a combined 400 from the other States and Territories (up 76%). Outside of Australia, over 2000 international entries have been received from 25 countries across the world. Despite a leveling off in Japanese tourism into Queensland, the Gold Coast Airport Marathon has maintained growth in Japanese entrants. More than 1,400 Japanese have entered the event this year, up 12% from last year." The Laguna Phuket International Marathon (more) was held in Thailand on 15 June, won by Australians Stephen Paine (2:37:52) and Angela Stephens (3:14:17). Russians dominated the 88th edition of Comrades Marathon (more) in South Africa, with Leonid Shvetsov setting an "up" run record of 5:24:46 from Durban to Pietermaritzburg to match his "down" record from last year. Elena Nurgalieva again edged out her sister Olesya to win her third "up" run in succession with a time of 6:14:36, five minutes outside her own record time. 13 June: The 2nd AIMS Marathon Symposium will take place on 8 November 2008, the day before the Athens Classic Marathon. The venue is the town of Marathon itself, the birthplace of the event. The theme of the Symposium is "Adding value to your Marathon" and builds upon the platform established by the inaugural Symposium held on 3 November 2007. The content of the Symposium is geared towards organisers of Marathon events but other interested parties are welcome to attend. Six main presentations will be spread throughout the day on such specific topics as "the needs of today's runners", "maximising media awareness" and "the role of supporting organisations" and will each be accompanied by panel and audience discussion and case studies offered by attending guests. The second annual AIMS Marathon Symposium is scheduled to take place on Saturday 8 November 2008. 10 June: The 27th edition of the Dresdner Kleinwort Frankfurt Marathon on 26 October 2008 will offer record prize money. With the support of the title sponsor the winners will earn 95,000 Euros, if they break either 2:07 (men) or 2:22:30 (women). Elite field manager Christoph Kopp said: “Because of the attractive prize money we expect runners who are able to achieve times of sub 2:07 to consider running the Dresdner Kleinwort Frankfurt Marathon this year." One of his major targets is to secure the return of Wilfred Kigen, three time winner and course record holder at 2:07:58. The women's record stands at 2:25:12. Present entry figures are up by around 10% on last year, when a record number of 11,507 were accepted. Including all running events the total field reached 18,302. If demand remains strong the Dresdner Kleinwort Frankfurt Marathon could reach the 20,000 barrier for the first time. The Nightmarathon (more) (ITA) on 7 June was run between two small Italian towns at the head of the Adriatic Sea, just east of Venice. The race started at 20.30 from the Piazza Santa Maria Elisabetta in Cavallino and after a 13km loop to the west the half marathon runners headed straight for Piazza Mazzini in the seafront town of Jesolo The Marathon runners bypassed the square and completed the second half of the race with a loop to the east before returning to Jesolo. Philemon Kipkering came home first in a lethargic 2:41:21, just 100m ahead of Ivano Novello. Croatian Marja Vracic was the first woman, in 2:58:32. The real,- BERLIN-MARATHON due to be run on 28 September, has sold out earlier than ever before. A total of 40,000 runners have entered the race, which is celebrating its 35th edition this year and has been the stage for five world records (men and women) in the last 10 years. The current world record mark of 2:04:26 by Haile Gebrselassie was set on the flat and fast Berlin course last year. A limited number of entries are still available through tour groups, and the Inline Skaters' event on Saturday 27 September is still open for registration. On 31 May the Stockholm Marathon (more) took place in its traditional Saturday afternoon slot, with wins going to Willy Korir (KEN) in 2:16:03 and Isabellah Andersson (SWE) in 2:34:14. Over in Albany, capital of New York State, Benita Johnson claimed her third win in the Friehofer's 5km Run for Women (more) overcoming a strong field of Kenyan and Ethiopian runners to record 15:46, six seconds ahead of Amane Gobena. Positions three to five were filled in the space of a single second. 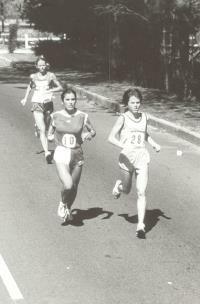 1984 Olympic Champion Joan Samuelson took the over-50s title. On 1 June the Zelenograd Half Marathon Sprandi was held just outside Moscow. In South America the Sao Paulo Marathon (more) took place in Brazil, and the Quito Ultimas Noticias 15km (more) was run in the Ecuadorean capital. The organisers of the Beirut Marathon will stage a mass Run For Peace on 1 June, hoping that last week’s election of a new president will speed the prospect writes Pat Butcher. The Lebanese capital has been a focus of unrest in the Middle East for more than 30 years. The Beirut Marathon Association has combined with the Italian-inspired Vivicitta movement – which began in 1984 - to stage two events: an international half-marathon sponsored by HSBC, and the 5km Run For Peace. The course takes the athletes on a tour of East and West Beirut, along the famous corniche, and passing along the ‘green line’ that once separated the two sides of a warring nation. The events finish in the iconic reconstructed downtown centre of bustling modern Beirut. BMA President May El Khalil said “HSBC Vivicitta Run for Peace" is unique and its timing perfect in celebrating a new peace in Lebanon, and in sending out a message of hope through sports”. The Terwamarathon (more) was held on 24 May in Oulu, Finland, one of the earlier fixtures in the Scandinavian running season. Next day the Edinburgh Marathon (more) and the ING Ottawa Marathon (more) were run, with approximately 14,000 and 33000 runners registered in each. In a tight contest in the Canadian capital course record-holder David Cheruiyot successfully defended his title, finishing five seconds ahead of Solomon Molla in a time of 2:11:00. In the women's race Morocco's Asmae Leghazoui finished five minutes clear of Elza Kireeva with 2:28:44. 23 May: Last Sunday, 18 May, Irina Mikitenko led 13,047 women home in the 25th AVON RUNNING Berlin women's race, the first edition of which had taken place back in 1984 with a field of 645 runners. The race traces a lineage back to a time when women's running was very much a minority pursuit, to the days before it was thought appropriate for women to compete at endurance running events. In 1978 AVON held the first of a series of annual global championships exclusively for women. First held in Atlanta, further venues included Waldniel (GER), London and Ottawa at which point (in 1981) the International Olympic Committee announced that a women's Marathon would be included in the 1984 Olympic progamme in los Angeles. Further AVON marathons, which attracted hundreds of runners from up to 27 countries, were held in San Francisco, Los Angeles and Paris. These seven AVON marathons hold a special place in Distance Running history. In Berlin, Horst Milde established the women's 10km race the following year, providing an unbroken link to the boom in present day numbers of women running distance races. 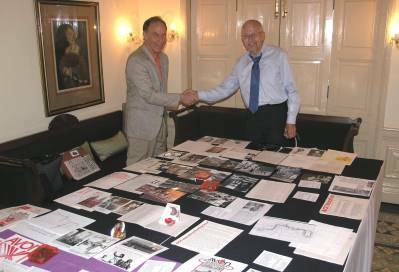 Above: Dr David Martin hands his AVON RUNNING archive over to Horst Milde, for future display at the AIMS Museum of Running in Berlin. Comprehensive archival material collected by AIMS statistician Dr David Martin, a key organiser of the first AVON RUNNING marathon in Atlanta in 1978, was recently passed to Horst Milde for housing in the AIMS Museum of Running in Berlin. 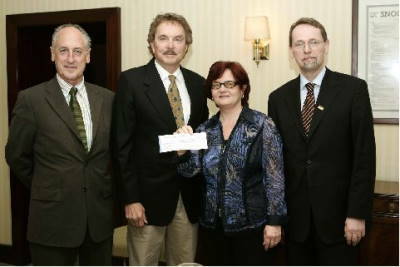 AIMS further made a donation of US$10,000 to the Museum, which will allow the material to be showcased. The AIMS Children's Run, held in the Rwandan capital of Kigali, took place on 11 May in conjunction with the Kigali Peace Marathon. Entries were over-subscribed as 1700 children took part but only 1250 could be registered. In what was effectively a fantastic curtain-raiser for the Marathon, 1700 children aged from 9-13 started from within the stadium just before the top athletes. They completed a separate lap on the surrounding roads before re-entering the stadium for the final 300m on the track. Medals and T-shirts sponsored by AIMS were given to all participants and awards were presented to the top 15 girls and boys, courtesy of ASICS and the "Runners help runners" programme conducted at the Tokyo Marathon. The Great Wall Marathon (more) was held on Saturday 17 May on a course that incorporates an out-back section on the wall itself, including thousands of steps. The same day the Goteborg Half Marathon (more) took place in Sweden. The following day, in the inaugural Sunfeast World 10km (more) in Bangalore, India, there were very close contests in both men's and women's races. World Road Running Champion Zersenay Tadese sprinted to a narrow victory over Moses Kipsiro over the final 350m on the stadium track. But in the women's race an epic last-lap sturggle between Elvan Abeylegessie and Grace Momanyi ended up with judges unable to separate them, declaring a dead heat. A mass "Open" 10km event was also run over the same course. The rest of the day's action, which comprised four marathons - took place in Europe. The Nordea Riga Marathon (more) in the Latvian capital, the Lodz Marathon (more) in Poland, the Glitnir Copenhagen Marathon (more), and the curious Karstadt Marathon (more) in Germany, where two starts in Dortmund and Oberhausen converge on a common finish line in Essen. The Kigali Peace Marathon held in the Rwandan capital on 11 May also hosted the second race in the 2008 AIMS Children's Series (see item below). The Pisa Marathon (more) in Italy and the Maraton Martin Fiz (more) in the Basque Provinces of Spain completed the day's programme. 6 May: The San Francisco Marathon, scheduled for 3 August, has selected 18 teams to raise funds for local causes. Since 2003 Cause to Run has helped to raise over $3 million in charity donations. The program gives non-profit organizations the tools they need to create fundraising teams at zero cost. Anyone who registers for any of the five San Francisco Marathon events (full marathon, two half marathons, 5K or progressive marathon) can join one of the Cause to Run teams, and raise funds for that specific cause. There is no cost or minimum fundraising requirement, making it easier for participants to raise money. "Through Cause to Run the San Francisco Marathon acts as a vehicle that connects us to every neighborhood it touches" said Meghan Steed, Director of Cause to Run. "It is a great program because it makes it that much easier for people to give back to their communities while accomplishing a great feat." Non-profits can focus on fundraising through running instead of organising their own events. The marathon has been part of the San Francisco community for the past 30 years. "We want our program to represent the Bay Area and support local non-profit organizations," said Steed. "At this year's marathon we hope to raise more than $1 million for the community." Registration for the 33rd Marine Corps Marathon (MCM) sold out on 5 May at 22.30 local time with 30,000 participants. Thousands of runners hit the MCM website, www.marinemarathon.com, as registration opened on 30 April to ensure a spot in the race on 26 October. The five-day sell out was the second fastest ever. In 2005, the race closed in under three days. See: http://www.marinemarathon.com/Assets/Reg+Closed+Release.pdf to view the press release. Peninah Arusei recorded 1:24:10 to break Susan Chepkemei's long-standing record in the Berlin Runs 25km (more) on 4 May, while in the men's event Samuel Karuku beat favourite Patrick Ivuti 1:13:49 to 1:14:04. The re-vamped race in the German capital, now in its 28th edition, finished inside the Olympic Stadium, and was declared a great success. The main 25km race attracted 6,012 runners and 1,628 entered the 10km event while 502 children ran a 2km race. Elsewhere it was all marathons - two in Europe: the Cracovia Marathon (more) (POL) and Maratona D'Europa (more) (ITA) and three in North America: the New Jersey Marathon (more), the Eugene Marathon (more) and the BMO Bank of Montreal Vancouver Marathon (more). 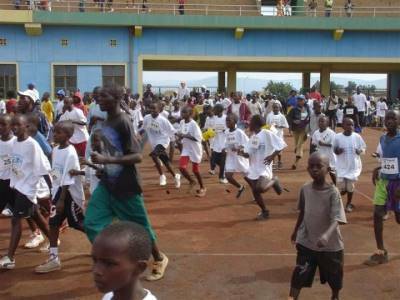 The 2008 AIMS Children's Series moves to its second venue next Sunday, 11 May, with a race in the Rwandan capital Kigali, held in association with the Kigali Peace Marathon. Both races start and finish within the national stadium, with the children performing a separate lap of about 5km. T shirts and medals are supplied to all runners, and prizes are awarded to the leading finishers thanks to co-operation from ASICS and runners in the Tokyo Marathon. Their contributions fund the prize list in all three venues of the Series through the "Runners help runners" programme. 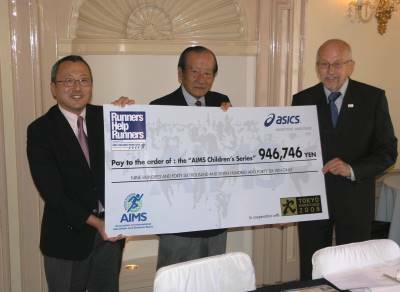 The proceeds of this were handed over by ASICS Marketing Manager Yutaka Sasai to AIMS President Hiroaki Chosa and Board member Horst Milde (pictured) at the AIMS Board meeting in Bangalore on 27 April. At the same time in the Conergy Hamburg Marathon (more) the winners ran even faster. David Mandago beat Wilfred Kigen 2:07:23 to 2:07:48, while Irina Timofeyeva ran 2:24:14 to win ahead of Pamela Chepchumba's 2:28:36. In the third really big European Marathon of the day, the Marathon Popular de Madrid (more), Chema Martinez took a home win in 2:12:42, beating Frederick Cherono by a minute. In the women's race a new name beat an old one: Rael Kiyara Kguriatukei ran 2:36:15 to finish 17 seconds ahead of Derartu Tulu. 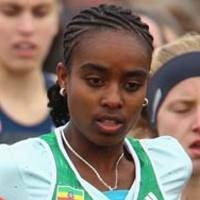 In the scenic iWelt Wuerzburg Marathon (more) in Germany Kidus Gebremeskel secured a lonely win in 2:27:10, 3km ahead of the rest, and Carolyn Meyer won the women's division. The traditional (since 1948) ING Enschede Marathon (more) in Holland, the Maratona Sant Antonio (more) in Padua and the Society of Torun Marathon in Poland completed a long list of seven European marathons held on the day. 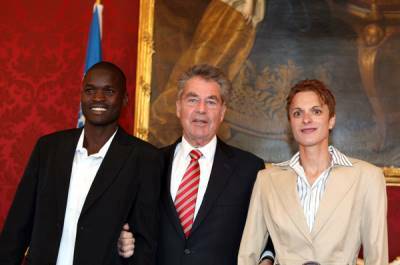 28 April: There was more honour for the winners of the 25th Vienna City Marathon a day after the race: The President of Austria Mr Heinz Fischer invited Kenya’s Abel Kirui and Romania’s Luminita Talpos for a reception in the famous Wiener Hofburg located next to the finish line of the race. The President is a runner himself and had met winners of the race in some previous years. 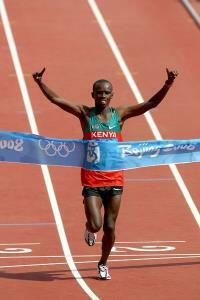 Abel Kirui had established a course record with 2:07:38, while defending champion Luminita Talpos had clocked 2:26:43. 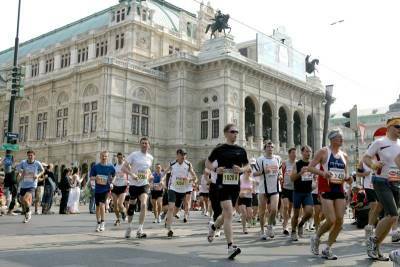 With world-class times, and 30,072 runners entered the silver jubilee race was the greatest running event ever seen in Austria. Luminita Talpos had been told about a possible reception a year ago, but then Mr. Fischer had to cancel the meeting because of other commitments. This time she had a problem herself before going to the Hofburg: “I was so focused on the race that I forgot to bring appropriate clothes.” She spent the morning shopping for a suitable outfit. The 112th BAA Boston Marathon (more) on 21 April had both 2007 champions defending their titles. Robert Cheruiyot who also won in 2003 and 2006, became the fourth person to claim four Boston Marathon crowns as his surge in the hills before 30km took him clear. He slowed significantly in the final stages to record 2:07:46 after at one point being on sub-2:06 pace, but had already broken the others. Abderrahime Bouramdane took second in 2:09:04. Jelena Prokopcuka showed willing in the early stages but Alevtina Biktimirova ran most aggressively, gradually dropping all challengers until only Dire Tune remained alongside her. The diminutive Ethiopian had the measure of the Russian in the final sprint, taking the win 2:25:25 to 2:25:27. On 20 April, four marathons, one half marathon, and one 10km race were held. Nephat Kinyanjui won the Nagano Olympic Commemorative Marathon (more) in Japan for the third time in a row. He won out in a frantic sprint over the last 200m, recording the same time as second-placed Tomohiro Seto, 2:14:17, with two others only two seconds behind. Alevtina Ivanova had a two-minute winning margin in the women's race, finishing in 2:26:38 ahead of a much-improved Kate Smyth (AUS, 2:28:51). Former world record holder Tegla Lorupe came in 12th with 2:49:15, The Dalian Marathon in China was followed by two in Europe: the Alexander the Great Marathon (more) in Thessaloniki (GRE) and the Zurich Marathon (more). In Zurich Oleg Kulkov recorded a personal best of 2:11:16, in beating a big group of Kenyans and Ethiopians who filled all other places in the top-10. The women's race was won by Tadelech Birra in 2:32:09, also a personal best. The Nice International Half Marathon (more) on the French Riviera saw some fast times, with wins by Dennis Ndisi (1:00:54) over Robert Kipchumba (1:00:57) and by Atsede Habtamu (1:10:49 from Lydia Cheromei (1:10:59). The Vancouver Sun Run (more), held over 10km on the Canadian west coast, rounded off action for the day. Robert Stefko (1:06:39) and Ivana Sekyrova (1:17:28), racing against domestic fields, had easy wins in the Pardubice Wine Half Marathon (more) in the Czech Republic on 19 April. On the same day in the Serbian capital William Kipchumba became the ninth Kenyan to win the Banca Intesa Belgrade Marathon (more) in 2:14:03, and nine of the top 10 men were Kenyan. Kipchumba was well adrift of the course record but over two minutes ahead of Jonathan Kipsaina (second in 2:16:14). Natalija Chatkina of Belarus also slowed in the rising heat but ran a personal best by five minutes, of 2:46:24. Nilaj Essen of Turkey in second place became Balkan champion. 17 April: The torch relay was greeting by cheering crowds in Belgrade this week, prior to the 21st annual Belgrade Marathon on Saturday 19 April. It was not the Olympic torch, but this one also came from Greece: not from Olympia, but from the home of the marathon, the town of Marathon itself. 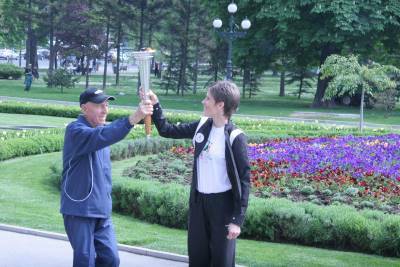 This torch is an initiative of the AIMS and the Athens Classic Marathon, which takes place in November. "We want to emphasise the origins of the marathon race, and give a new dimension to our colleagues' marathon races abroad," said Athens Classic Marathon director Makis Asimakopoulos. Neighbouring Belgrade was the first recipient in Europe – Xiamen in China was the first, for the 16th World Congress of AIMS last year. The flame was flown from Athens to Nikola Tesla Airport, 20km outside Belgrade, and relayed into the city. Citizens of the Serbian capital turned out in force to see last year's Belgrade Marathon women's winner, Olivera Jevtic, and 1956 Olympic silver medalist, 87-year old Franjo Mihalic, deliver it to the City Hall. Mihalic is also a former winner of the Athens Marathon. William Kipsang set a new course record of 2:05:49 in the Fortis Rotterdam Marathon (more) on 13 April, beating Felix Limo's 2004 mark by 25 seconds. After the heat of last year conditions were good for marathon running with little wind and a temperature of 12C. Kipsang kept with a group up to 30km but escaped to build a 7-second lead by 35km and went on to win from Daniel Rono by over a minute. Lyubov Morgunova took the women's race in 2:25:12. Many of the top finishers in both men's and women's races set personal bests, which included a new Finnish record of 2:10:46 for Janne Holmen in ninth place. Stephen Kibiwott won the Turin Marathon (more) for the second time as he finished in 2:10:12 at the head of a file of five runners. Vincenza Sicari dipped under 2:30 in the women's race for an Olympic qualifying time. The Canberra Marathon (more) held in the Australian capital on 13 April was won by Mark Tucker in 2:24:13 and Jackie Fairweather in 2:46:01, but neither of them rested on their laurels. Canberra uniquely also offers a 50km option run concurrently with the Marathon, and both of them went on to complete double wins, in 2:53:47: and 3:19:12 respectively. 15 April: A tiny device used to measure road race courses all over the world was given a new lease of life as the Jones Counter JR model went on general sale yesterday. Counters can be ordered through the website www.jonescounter.com. The original counter was named after its inventor Alan Jones and first manufacturer, his son Clain Jones. 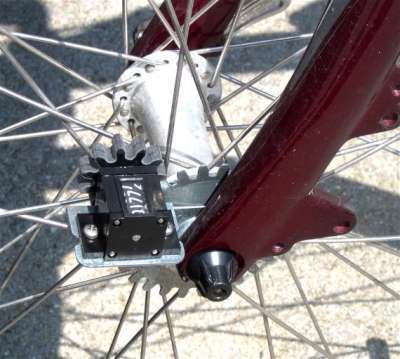 Over the 35 years since it was first used back in 1972 some modifications had been made but in recent months it had become increasingly difficult to obtain, as crucial components required in its assembly became unavailable. The answer was to reinvent the counter with a new design and different component parts. Months ago Tom Riegel came up with a new design, but it took many exchanges with the fabricator of the new component parts before an order could be placed, on 21 January. This first involved making the tools which would be used to produce the components, but the first installment of the 1000 sets of parts ordered were finally collected from the fabricator on 28 March. Several dozen counters were rapidly assembled and made available to AIMS and IAAF. Tom Riegel himself was among a party of four who checked the changes to the 2007 London Marathon course using the new counter. It was found to work perfectly. The new JR model prolongs the life of this simple but vital tool in servicing road runners and organisers all over the world with accurately measured courses, including the Local Organising Committee of the Beijing Olympic Games. Despite high-tech GPS systems becoming widely available in recent years no method of measurement has yet come close to level of accuracy and reliability that is attainable by using the Jones Counter. 14 April: The Marine Corps Marathon has announced registration procedure for the 2008 event, to be held on 26 October. Runners from across the USA and around the world can register on a first come, first served basis by clicking the link to registration on the MCM website, www.marinemarathon.com, beginning at 12.00 Eastern Time on 30 April (18.00 in EU countries, 02.00 on 1 May in Japan). The race field is limited to 30,000 participants and is expected to fill up quickly. “Runners mark their calendars months in advance for the opening of online registration and its not unusual for us to register thousands of runners in the first hour after opening” said race director Rick Nealis. The short registration process includes accepting a waiver, completing the form, clicking through payment (US$88) and receiving a confirmation email. Confirmation emails will include a runner’s registration number, imperative to access e-confirmation cards online beginning in September. E-confirmation cards are required at Packet Pick-up, part of the Health and Fitness Expo prior to the MCM, to retrieve race materials. In the Paris Marathon (more) on 6 April 20-year old Ethiopian Tsegaye Kebede posted the second fastest time of the year to win in 2:06:40 while Martha Komu smashed her personal best by seven minutes to win the women's race in 2:25:33. The sunny, cold (5°C) and still morning favoured fast times and the top eight men and top seven women set personal bests. The top 12 men dipped under 2:10 and Kebede came within seven seconds of the 5-year old course record. Patrick Makau won the Vattenfall Berlin Half Marathon (more) in exactly one hour, just one second ahead of Eshetu Wondimu. Peninah Arusei won the women's race in 68:22, third fastest this year, as the race broke the previous participation record for a Half Marathon in Germany, attracting 20,660 entries. In the inaugural Poznan Half Marathon (more) (POL) Nathan Soimo from Kenya had a runaway win in 1:05:59 while Karolina Jarzynska took the women's race in a much closer competition, 1:12:33 to Dorota Ustianowska's 1:12:42. The re-vamped Santiago Marathon (more) in Chile on 6 April was wone by Roberto Etcheverria in 2:15:39. He beat a trio of Kenyans and made the Beijing Olympic qualifying time. Natalia Romero won the women's race. The North Pole Marathon (more) took place on 1 April at 04:30 GMT in perfect 24-hour daylight and -29°C temperature in neutral polar ocean. 6 April: A suicide bomber exploded himself and killed 13 others at the start of a marathon organized in connection with Tamil and Sinhala New Year celebrations, writes Ram Murali Krishnan. The race was held at Weliweraya, 20km from the Sri Lankan capital, Colombo. 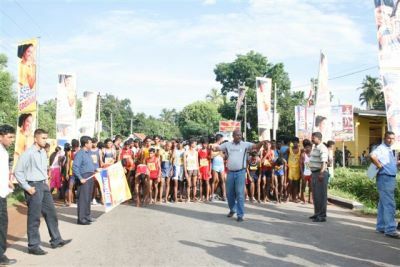 The bomber posed as an athlete and triggered the bomb when Jeyaraj Fernandopulle, Minister of Highways and Road Development, flagged off to start the race. The minister later succumbed to injuries in hospital. Lakshman de Alwis, the committed national athletics coach and Kuruppe A. Karunartne, a veteran marathon runner were among those killed. Karunaratne (47) represented Sri Lanka at the Barcelona Olympics (1992) and World Championships the following year. He won back-to-back South Asian Federation Games marathon titles in 1991 (Colombo) and 1993 (Dhaka). Sri Lankan government spokesman Lakshman Hulugalle confirmed the death of Alwis and Karunaratne. As many as 90 people were reported injured. 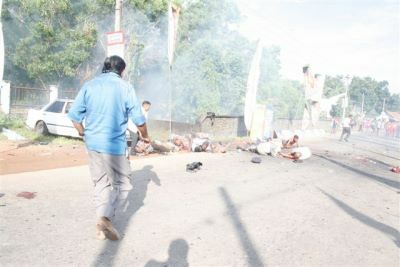 Explosions have previously occurred at sporting events held in and around Colombo, to attract global attention by groups fighting for a separatist Tamil state, but this was the first time that lives were lost in an attack. The sympathies of the entire sporting world are with the athletes, officials and the families of those who perished or sustained injuries in today’s incident. Expectations for new course records had been high for the 10th anniversary edition of the Hervis Prague Half Marathon (more) on 29 March but strong winds in the Czech capital dashed hopes. Kenya’s Eliah Muturi Karanja and Ethiopia’s Asha Roba Gigi took top honours with winning times of 1:02:08 and 1:12:00 respectively. A total of 5812 runners took part, 20% up on last year's figures. The 36th IAAF World Cross Country Championships (more) were staged in Edinburgh on 30 March, on a challenging lap within Holyrood Park. Slippery conditions underfoot caused some upsets, and five-time winner Kenenisa Bekele had to stop to pull his shoe back on before working his way back to the front of the field. 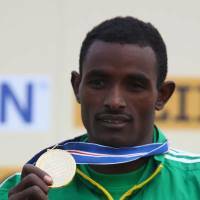 He glided away on the last lap to clinch his record sixth title, and complete Ethiopia's sweep of individual titles on the day, alongside Junior Men's winner Ibrahim Jeilan and Tirunesh and Genzebe Dibaba. Like Bekele, Tirunesh found the cold, blustery conditions more to her liking than the heat and humidity of last year's championships in Mombasa. She reclaimed top spot for the third time after earlier having seen her younger sister Genzebe show sound tactical sense in holding back behind the early leaders in the Junior Women's race and unleashing a kick on the final downhill slope to win by five seconds. The last clean sweep of individual titles was achieved by Kenya back in 1994. In the team competition honours were evenly split, with Junior and Senior Women's events taken by Ethiopia and the Men's by Kenya. Also on 30 March the Incheon Half Marathon (more) took place in Korea, followed by the AmBank Kuala Lumpur Marathon (more) in Malaysia. Elsewhere two other half marathons and two other marathons were held. The Tarsus Half Marathon (more) was run near the Mediterranean port of Adana in Turkey and the Novi Sad Half Marathon (more) in Serbia. The Treviso Marathon (more) started in three separate places: Vittorio Veneto as usual, but also Vidor and Ponte di Piave. The routes converged at 22km on the Ponte della Priula, crossing the River Piave. Runners wore color coded clothing so that a spectacular "tricolor" effect was created at the merge point. The Monaco Marathon (more), also held on 30 March, shifted to a spring date from its last edition in November 2006, to take advantage of the famously pleasant spring weather of the French Riviera. It also moved to a new start from Boulevard Albert I, which also serves as the starting grid of the Monaco Formula 1 Grand Prix. Geoffrey Mutai did well to record 2:12:40 on the undulating course which passes through three national territories (Monaco, France and Italy). Kenyans filled the top four positions in the men's race and Russians four of the top five in the women's. Zimbabweans and Russians dominated the Old Mutual Two Oceans Marathon (more) in Capetown, South Africa on 22 March (its traditional Easter Saturday date). Marco Mambo took the men's title, recording 3:11:35 for the 56km race to win by just under a minute from South African Mzwanele Maphekula. Russian twins Olesya and Elena Nurgalieva finished 1-2 in the women's race, with Olesya about 150m ahead of Elena. Russian women also filled the next two places and the only South African woman to break four hours in this year's race was Riana Van Niekerk in 5th with 3:53:09. In the associated Half Marathon event Zimbabwean George Majaji pipped South Africa's Lusapho April 1:03:31 to 1:03:34, while Lesotho's Mamorallo Tjoka won the women's race by a similar margin from Zimbabwe's Tabitha Tsatsa, 1:15:05 to 1:15:08. Originally scheduled for 26 March, the North Pole Marathon has been postponed due to a delay in setting up the Russian camp at the North Pole. Organisers and competitors assembled at Svalbard (80degN) now expecting the race to take place on 31 March. 19 March: Exactly 30 years ago - it was Palm Sunday 1978 - in Atlanta Georgia, an extraordinary marathon was staged which many believed raised international awareness of the desire among women for long-distance running events as part of the Olympic Games competition programme. It was the Avon International Women's Marathon - funded by the well-known manufacturer of health and beauty products for women - the first in a series of seven marathons held annually around the world - providing a global stage for women to demonstrate their talent at distance running. In 1981 the International Olympic Committee announced that a women's marathon would be part of the Olympic programme at the 1984 Los Angeles Games. There is little doubt that the first four Avon marathons - in such diverse locations as Atlanta, Waldniel (GER), London, and Ottawa - with runners assembled from as many as 27 countries on five continents - provided powerful evidence for the appropriateness of such a decision. That first race of the series in Atlanta on 19 March 1978 had 225 starters from 9 countries, and 136 runners finished. Rising newcomer Marty Cooksey, right, passes veterans Cyndy Dalrymple (behind) and Gayle Barron to win the first Avon International Women's Marathon. The winner was Martha Cooksey (USA) in 2:46:16. The next year in Waldniel the field grew to 263 starters from 21 countries and Joyce Smith (GBR) finished in 2:36:27 ahead of 185 others. Lorraine Moller (who 12 years later was to collect a bronze medal in the Barcelona Olympic Marathon) won the 1980 Avon race in London with 2:35:11. Among the other 154 finishers from 27 countries was the future 1984 inaugural Olympic Marathon Champion Joan Benoit, who was fourth in 2:38:42. In the following years races were held in Ottawa (1981), San Francisco (1982) and Los Angeles (1983), one year before the Olympics were due to be staged in that city. Julie Brown (USA) won that race in the fastest time recorded for the series, 2:26:26. The final Avon race was held only three months later, in Paris on 23 September 1983. In final preparation for the Olympic stage Lorraine Moller won again in the tightest finish so far (2:32:44 to Carla Beurskens' 2:32:53) from a field of 708 starters and 612 finishers. After announcing that he will not be contesting the Olympic Marathon earlier in the week (see item below), Haile Gebrselassie dominated the field in the Lisbon Half Marathon (more) on 16 March. Running alone after 10km he finished in 59:15, 500m ahead of the rest of the field but well adrift of the 58:35 world record for the distance. For the first time the Lisbon course offered a record-eligible course to the elite field (the spectacular mass start is still on the 25 Abril Bridge, high above the Tagus River). Elsewhere fast times were also run in both the Seoul International Marathon (more) and the Maratona della Citta di Roma (more). Galina Bogomolova crossed the finish line in the famous Fori Imperiali in the heart of the Eternal City over five minutes clear in 2:22:53, the third fastest time of the year. "When I realized I could dip under 2:23 I pushed hard in the last kilometres,” she said. She earned 16,000 euros for the win and 50,000 as bonus for the Italian all-comers record. Jonathan Yego just ducked under 2:10 to win a close battle over the final stages in the men's race. As in Rome, in the Seoul Marathon the first six men home were also Kenyans, as Sammy Korir raced to a win in 2:07:32, leading home compatriots Jason Mbote and Edwin Komen in sub 2:08 times. It was Korir's fourth fastest time, but Mbote and Komen, along with nine others in the top-20, all recorded personal best times. Shujing Zhang won the women's race in 2:26:11, five years since her previous win in Seoul. The final event of the day provided a complete contrast. Instead of densely populated world capitals, the world's most southerly certified marathon, took place in the windswept and sparsely-populated Falkland Islands in the South Atlantic. The field for the Standard Chartered Stanley Marathon (more), which makes use of practically all the surfaced road available in the territory, was split evenly between individuals and 4-person relay teams. In unusually balmy conditions Simon Almond won in 2:55:46, displacing three-time winner Hugh Marsden in a close race. Marsden finished just behind the winning relay team from the Falkland Islands Defense Force. Never before has such a galaxy of athletic stars from Kenya's past, present & future gathered together in one place writes Toby Tanser. 15 March was a day of joyous celebration in Iten at the Shoe4Africa Peace run. More than 560 schoolgirls came out to run a 4km peace run powered by Leppin. The amazing support cast of Kenya’s international stars was led by World Marathon champions past and present, Douglas Wakiihuri and Luke Kibet. They walked through Iten in an athletic peace parade with children singing and dancing behind them, all dressed in yellow T-shirts and shouting "Amani Kenya" (Peace in Kenya). They hugged, cried and danced - and the athletes, many of whom had not seen each other in decades, did likewise. Priscah Jepteling was the winner of the girls’ race, flagged off by Nyandika Maiyoro and Wilson Kiprugut, the first Kenyan to run in the Olympics and the first Kenyan to win an Olympic medal. Chris Cheboiboch and Timothy Cherigat, a Boston runner-up and a Boston winner, were rabbits to lead the girls on pace. Holding the finishers tape were the flag bearers Wakiihuri, a Kikuyu, and Kibet from the Kalenjin. presented a new windows vista laptop computer to Kiptingo Primary school at the awards ceremony. Money for books went to the second placed school, awarded by Moses Kiptanui, and Moses Tanui gave out a similar prize for Kamariny Primary. Another legend of the sport, Olympic steeplechase champion Matthew Birir presented sports watches to the top three individual finishers. As the international athletes introduced themselves, the crowds sang. The day ended with Douglas Wakiihuri embraced by the crowd after teaching the schoolchildren a song he had written in the local Kalenjin tongue. The area MP, Mr Cheptwony, and the acting District Commissioner were also in attendance. Daniel Komen World Champion, 1997; Matthew Birir Olympic Steeplechase Champion, 1992; Moses Tanui World Champion 10000m & Half Marathon; Moses Kiptanui Three time world champion steeplechase Olympic silver; Kimutai Kosgei Amsterdam Marathon champion, Boston runner up; Timothy Cherigat Boston Marathon Champion, 2004; Luke Kibet World Marathon Champion, 2007; Lornah Kiplagat World champion cross country, double world champion road; Chris Cheboiboch Fastest ever runner up at the New York Marathon; William Koila former world best junior 1500m record; John Yuda (TAN) World Half Marathon and world cross country silver medallist; Mike Boit Olympic Bronze 1972, Commonwealth Games Gold 1982; Paul Koech World Half Marathon Champion, 1999; Ben Maiyo Second place Boston Marathon; Janeth “Eldoret Express” Jepkosgei World 800m champion, 2007; Ezekiel Kemboi Olympic Steeplechase Champion, 2004; Japheth Kimutai Commonwealth Games Champion 800m, 1998; Douglas Wakiihuri World Marathon Champion 1987, Olympic Silver 1988; Nyandika Maiyoro First Ever Kenyan to run in the Olympics; Wilson Kiprugut First Olympic medalist for Kenya bronze 800m, 1964 (and 1968 Silver); John Litei Commonwealth Games 800m bronze, 2006; Fred Kiprop, 2:06 Amsterdam Marathon; Katui Kipkemboi, Asian Games Silver 5000m; Duncan Cheruiyot ParaOlympics double gold medallist, 2004; Sylvia Kibet African Games & African Championships bronze medallist; James Kosgei Road Racer of the year four times; Luke Kipkosgei Internationalist; Rebbie Koech Internationalist; Peter Tanui Internationalist; Christopher Koskei World Steeplechase Champion, 1999; Paul Cherop 1970s Internationalist; Sammy Maritim 1970s Internationalist 10000m; Ben Kogo Olympic Games Silver, 1968; Fatwell Kimaiyo Kenyan record holder 110m hurdles; Rose Tata First Kenyan woman to run in the World Championships; Kefah Kerero 2:13 marathon; Jonah Birir 5th in Olympic 1500m; David Kiptoo 1:43 800m Internationalist; Yobes Ondieki World record 10000m, 1993; Hosea Rotich Fastest ever marathon in Kenya; Joyce Chepchumba Olympic Bronze Marathon, 2000; Amos Biwott Olympic Gold Steeplechase, 1968. 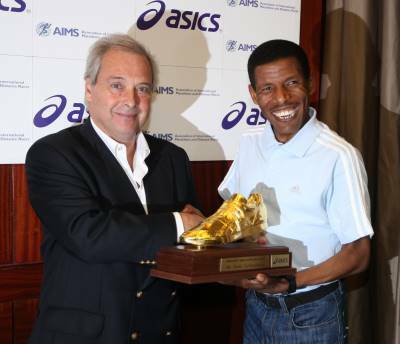 Haile Gebrselassie was presented with the AIMS/ASICS Golden Shoe at the Hotel "Le Meridien" in Lisbon on 14 March in recognition of his performances throughout 2007. He received the top award in world road racing from AIMS Vice President Carlos Moya prior to the Lisbon Half Marathon on Sunday 16 March. He has now won two years in a row, something that no other male runner has achieved since this award was first presented in 1992. Twice Olympic champion at 10,000m Gebrselassie ran his first serious marathon in 2002, recording a time of 2:06:35. He improved to 2:05:56 in Berlin in 2006 and last year, on the same course, set a new World Record for the distance of 2:04:26. If his time for 2008 (2:04:53), the second fastest ever run, remains unbeaten this year he will have led the Marathon standings for the last four years – longer than anyone else since the distance was standardised in 1924. Haile Gebrselassie commented "It means a lot that so many people at the top of world running voted for me. To win this prestigious award two years in a row is very special and I feel greatly honoured." 11 March: Charities have been using marathons as fundraising vehicles for many years, but a recent survey by the Run Walk Ride Fundraising Council (USA) claims that, at least in the US, more and more events are raising more and more money. The take-up among active participants in such events increased by 12.1% in 2007 and is expected to grow at a similar rate this year. The top thirty fundraising "thon" programs generated more than $1.64 billion for charity last year, up from $1.46 billion in 2006, reports the Council's second annual "Run Walk Ride Thirty" study. "Executives who manage these events are optimistic that they will raise even more money in 2008 in spite of challenging economic times," said David Hessekiel, president of the Run Walk Ride Fundraising Council, which is holding its annual conference in Atlanta today. "There's growth at both ends of the spectrum from huge well-established programs to up-and-coming new initiatives," said Hessekiel. He went on to cite key factors fueling the expansion as technological (improved online fundraising tools), social (doing good is very much in vogue) and managerial. The professionalization of athletic event fundraising, as demonstrated by the formation of the Run Walk Ride Fundraising Council in 2007. These top five programs demonstrate the diversity in this field. Activities offered are appropriate for everyone from the couch potato to the serious athlete. Three of the events are traditional local charity walks. The Relay for Life engages teams of people to walk around a circuit for up to 24 hours while Team in Training prepares supporters to participate in any number of different marathons, half marathons, triathlons and 100-mile bike rides which may be in distant locations. It took at least $6.8 million in revenue to make it into the top 30 this year, a leap of $800,000 and 13.3% more than in 2006. The AIDS Walk NY filled 30th spot. In spite of the difficult economic climate survey respondents are optimistic they can continue to bring in more money in 2008. All 32 of the respondents to this question forecast their revenue would grow. The average estimate was 12%, but predictions ranged from 1.5% to 100%. Recruiting more teams and increasing the amount each participant raises were the two growth strategies most commonly cited by study participants. The Run Walk Ride Thirty is primarily based on survey responses from the professionals who manage well-known athletic event fundraising programs. If a nonprofit does not participate, the council seeks out public sources to obtain key statistics. 10 March: Haile Gebrselassie says he will not run in the marathon at the 2008 Beijing Olympic Games because of fears that the pollution in the city would be a threat to his health. Gebrselassie, who suffers from asthma, set the world record of 2:04:26 in Berlin on 30 September 2007, and his form was confirmed in January with the second fastest-ever time for the event of 2:04:53. He twice performed relatively poorly in the London Marathon before realising that his condition was exacerbated by conditions in the city at that time of year. He missed the 2007 event in London partly for that reason. His manager Jos Hermens confirmed that Gebrselassie did not wish to jeopardise possible future performances, and cited the possibility of running the marathon in a time below 2:04, something which Gebrselassie himself has mentioned before. He is still likely to compete in Beijing in the 10,000 metres, an event at which he has already won two Olympic gold medals. Hermens also commented that Olympic sites selected in the last three decades, with the single exception of Sydney in 2000, have offered very unfavourable conditions for athletes performing in endurance events. 10 March: The 37th edition of the BMO Vancouver Marathon, which takes place on 4 May this year, will offer a new 'taster' for the main event, with the creation of the XLR 8K, sponsored by North Shore Auto Mall Dealers. The fast, flat course follows the first four kilometres of the full marathon course before doubling back to the finish line. This latest race offering builds on the full marathon team relay option that was introduced last year in which 5-member teams get together and divide up the marathon route between them, into 8.4km sections. Both corporate and community teams are eligible, in male, female or mixed categories (where at least two runners are female). In the inaugural edition of the relay 72 teams registered, and around 100 are expected this year. Marathon debutantes came out on top in the Nagoya International Women's Marathon (more) on 9 March, with Yurika Nakamura's winning time of 2:25:51 good enough to win her an Olympic place over the 2:25:34 recorded by Tomo Morimoto in finishing second in Osaka. Naoko Takahashi faded early and eventually finished 27th in 2:44:18. Others in the Olympic team are Reiko Tosa, who was pre-selected, and current Olympic Champion Mizuko Noguchi, who won the Tokyo Marathon in November with 2:21:37. The men's team, also announced on 10 March, consists of Tsuyoshi Ogata, Atsushi Sato and Satoshi Osaki. Elsewhere in Japan the Kyoto City Half Marathon (more) was run. In Italy the Ferrara Marathon (more) celebrated its 30th edition with a new course showcasing the splendid sights of the historic city, while the first edition of the Lago Maggiore Half Marathon (more) was won by Sergey Lebid and Melissa Peretti, who recorded 1:03:32 and 1:14:50 on a scenic route around part of the famous shoreline of the Lake. In a more urban setting Kenyans dominated in second edition of the Sao Paulo Half Marathon (more), with Kiprono Mutai and Eunice Kirwa both setting course records. Seven runners went under 2:10 at the Lake Biwa Marathon (more) on 2 March headed by Asian Champion and second-placed finisher in last summer's World Championships Mubarek Hassan Shami (QAT, 2:08:23). 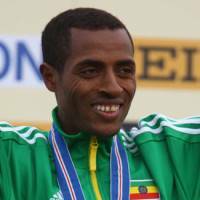 Yared Asmeron (ERI) took nearly seven minutes from his personal best time to finish second in 2:08:34, although he was almost caught by a fast-finishing Satoshi Ozaki. The race had also provided a last opportunity for Japanese men to qualify for the Olympic team and Osaki ran a determined and well-judged final 5km. He finished third with 2:08:36 - just 4 seconds inside the crucial time set by Arata Fujiwara, the top Japanese finisher in the Tokyo Marathon held two weeks previously. 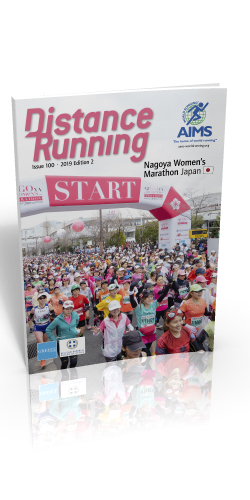 The full selection will be announced on 10 March, the day after the final selection race for the women, the Nagoya Marathon. The Lala Marathon (more), held in the northern desert town of Torreon at 1000m altitude lived up to its reputation, in its 20th edition, as a showcase event for Mexican Marathons, with exciting come-from-behind victories in both the men's and women's races. The men's race in particular saw local hero Procopio Franco haul back the Kenyan pair of Hilary Kimaiyo and Julius Kipyego after they raced into a huge early lead. The XXIII City of Los Angeles Marathon (more) provided happier hunting ground for Kenyan runners with a win by Laban Moiben in 2:13:50 and Kenyans filling seven of the top ten places. In Africa the 6th Kilimanjaro Marathon (more) took place on the roads around the Tanzanian city of Moshi. The 3rd Oeger Antalya Marathon (more) was run on the south coast of Turkey, against the backdrop of the majestic snow-covered Taurus Mountains while at the other end of the Mediterranean the Barcelona Marathon (more) had 7,609 finishers under the 6-hour limit - 60% up on last year. On Monday 3 March the 100km del Sahara (more) started from the desert settlement of Chenini in Tunisia. Stages of 22km, 20km, 8km, 42km and 22km were completed on the following days until the race finished in the oasis of Ksar Ghilane on 6 March. The 9th edition of the Antarctica Marathon (more) was run on King George Island on 5 March, although results are only expected in a week's time. 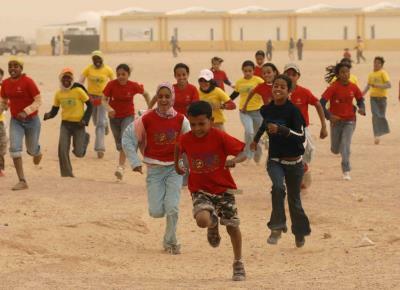 The first race in the AIMS Children's Series 2008 was run on 25 February in conjunction with the Sahara Marathon. 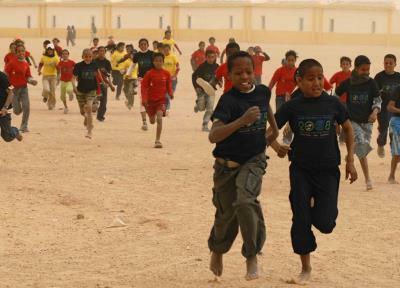 Children ran over the compacted sand of the scrub desert floor within the Smara refugee camp in the far west of Algeria, which is also the location of the finish to the Sahara Marathon. Smara is one of several camps set up to house refugees from the Western Sahara after the territory was occupied by Morocco 30 years ago. The children who participated in the races were born and brought up in these camps, and see the races as a strong connection to the outside world. The AIMS Children's Series enjoys co-operation with ASICS and benefits from a direct "Runners help runners" scheme funded by participants in the Tokyo Marathon, held one week previously. ASICS running shoes and equipment were awarded, and all children participating received a T-shirt and finisher's medal. A comprehensive set of new World leading times were posted at the World Best 10km (more) on 24 February, as Lornah Kiplagat took her fifth consecutive victory in 31:02 just 10 seconds ahead of Mestawet Tufa. In the men's race Deriba Merga won by a single second in 28:03, benefiting from a mistake made by Silas Kipruto as he went off course just before the finish line. The Philippine Marathon (more) was also held on 24 February, followed in Europe by the Guiseppe Verdi Marathon (more) in Italy and the Marathon de la Ciudad de Sevilla (more) in Spain. The Sahara Marathon was run on 25 February between the Sahrawi refugee camps in the far west of Algeria. The race also hosts the first event in the AIMS Children's Series 2008. The Lahore Marathon, previously scheduled for 24 February, has been postponed to 6 April 2008. 26 Feb: The Zurich Marathon, to be run on 20 April 2008, will relax the time limit from 5:00 to 5:30 hours. This allows the slowest runners an extra 42.65 seconds to complete each kilometre of the race. By contrast, Swiss national record holder Victor Rothlin, who set a new mark of 2:07:23 in Tokyo on 17 February, improved his previous record (2:08:20 in the 2007 Zurich Marathon) by 1.35 seconds per kilometre. In the 2007 race only 214 of the 4860 starters failed to finish - and only some of these will have been "beaten by the clock". The relaxed time opens the race up, and is likely to attract many more race entrants confident of finishing within the new limit. 25 Feb: Known for their commitment to impeccable organization, the Marine Corps Marathon brings 32 years of planning experience to the creation of a new series of running events. The Inaugural Marine Corps Historic Half will be held on 18 May: "The Marine Corps Historic Half sold out in just a few days, but runners are still asking to participate," said Rick Nealis, Race Director. "In response to the great interest, we've opened the Semper Fred Fun Run to allow many more people to take part in this exciting event". The two-mile just-for-fun challenge offers runners and walkers of all ages the chance to get in on the race day excitement. Starting at 07.15, just minutes after the start of the Historic Half, the out-and-back run will follow the first mile of the Marine Corps Historic Half, starting and finishing outside the Fredericksburg Expo & Conference Center on Carl D. Silver Parkway. Online registration for the Semper Fred Fun Run is now available at: www.MarineCorpsHistoricHalf.com. The $12 registration fee includes a commemorative t-shirt. Register early, as the race field is limited to 2000 participants. 22 Feb: Half Marathon world record holder Lornah Kiplagat defends her title at the World Best 10km race in San Juan on 24 February writes Dave Keuhls. Kiplagat has won this race four times in a row, and five in total. The only interruption to her winning sequence was when Paula Radcliffe set the world record for 10km here in 2003 (30:21). But Kiplagat dropped out halfway through the Dubai Marathon last month complaining of a calf injury. 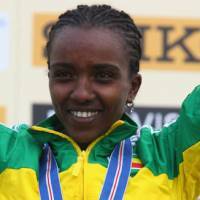 Her recovery will be tested by Eligayehu Dibaba and Romania's Luminta Talpos. Kiplagat's familiarity with the course and conditions here contributed to her victory last year over 5000m world record holder Meseret Defar and in 2004 over Paula Radcliffe. "I just like to run here," she said. "Every time I get here a week early and that makes it very nice and relaxing." Men's defending champion Gilbert Okari faces Deriba Merga, third in the IAAF World Road Running Championships last October. 20 Feb: This year's Vienna City Marathon on 27 April will be the 25th edition of Austria's biggest road race, and entries are soaring in anticipation of the occasion. Already 9000 runners have registered for the marathon, and associated half marathon, relay, and junior and children's races. The Marathon has established itself as a major international fixture. The elite fields recruited have grown stronger in recent years but the race can also offer a unique combination of sports and culture. The first edition of the race was run on 25 March 1984, and organisers were proud to register 794 finishers at the Heldenplatz. This spectacular finish still serves the race well. Back in 1984 Helmut Zik, the Austrian Minister for Education, had prophesized: "In the future we will have ten times as many participants," - and his words have proven true. But there was a difficult period soon after the foundation of the race when entries stagnated. Wolfgang Konrad took over as race director in 1989 and this year marks his 20th event in charge. Under his leadership the 1995 race was the first to use chip timing for the entire field. In 2007 a record field of 26,249 runners from more than 80 countries participated in the event. It looks very likely that this year's jubilee race will attract an even greater number. At the sharp end, the course records stand at 2:08:20 to Morocco's Lahoucine Mrikik (2006) and 2:23:47 to Maura Viceconte (ITA, 2003). 20 Feb. "I am coming back to Prague to beat my own course record", says Caroline Kwambai, but she also has other reasons to return to the Czech capital on 29 March. The 32-year old mother of three from Kenya set the course record in the 2006 Hervis Prague Half Marathon, but came second in last year's race, just a few centimetres behind the Russian Lilia Shobukhova. Kwambai's best time is 1:09:47 from the Porto Marathon in 2005, so a new course record in Prague could also be a new personal best. Patrick Makau went one better in the Ras Al Khaimah Half Marathon (more) on 8 February , just out sprinting Tsegaye Kebede to win in 59:35 - 22 seconds slower than when he finished second to a world-beating run by Sammy Wanjiru last year. With three men under the hour in that race and four such performances this time around, the RAK Half Marathon has invigorated the distance running circuit at elite level. The women have not yet risen to this new challenge, with slow races being decided by a sprint over the last few hundred metres. The Egyptian Marathon (more) was held in Luxor on Friday 15 February, followed on 17 February by the second edition of the hugely successful Tokyo City Marathon (more), with 30,000 runners. The Standard Chartered Hong Kong Marathon (more) followed and, in Europe, the Maraton Popular de Valencia (more) completed action for the day. Big Sur Marathon Race Director Wally Kastner was inducted into the Hall of Champions at the 2008 Running USA Conference on 14 February. "Great events require great leadership," said Running USA CEO Basil Honikman. He called the Big Sur Marathon "one of the jewels of American running" and praised Kastner for the outstanding organization he has developed. Kastner has been race director of Big Sur since 1997 and was a founding board member of Running USA in 1999. Big Sur Marathon has grown impressively, and the non-profit organization has created other successful running events such as the Half Marathon on Monterey Bay, the Mud Run, the burgeoning JUST RUNÂ® youth fitness program, and the JUST RUN! Just Kids 3K races. Accepting the honour, Kastner highlighted the importance of youth fitness, saying "I believe that runners can save America." The 2008 conference concentrated on programs to combat childhood obesity and juvenile diabetes, including Big Sur's award-winning JUST RUN program that is now being adopted in communities throughout the USA. Kastner joins a distinguished list of honorees including Amby Burfoot of Runner's World Magazine, Guy Morse of the Boston Marathon, Bill Roe of USA Track & Field, Rich Benyo of Marathon & Beyond and Allan Steinfeld of the New York City Marathon. Running USA is the trade organization for the running industry, devoted to improving the status of road racing and long distance running in the United States. 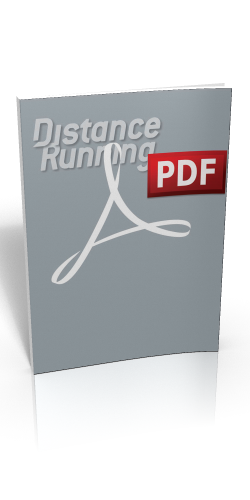 The Canadian Athletics Federation has launched a new website: www.runcanada.ca, specifically dedicated to road running and race walking in Canada. Site features include athlete profiles, a photo gallery, calendar and results, and news from the Canadian road racing community. Athletics Canada is the national governing body for the sport of track and field in Canada, including cross-country and road running. In the past there has been little recognition of the "ex-stadia" events, but this latest move goes some way towards acknowledging road racing as the current driving force under the "athletics" umbrella, mobilising hundreds of thousands of active participants within Canada. When Sammy Wanjiru of Kenya won the inaugural Ras Al Khaimah Half Marathon last year in 58:53, two seconds faster than the world record, the name of the second smallest of the United Arab Emirates went round the world writes Pat Butcher. It's a hard act to follow, but on Friday 8 February last year's runner-up, Patrick Makau, and Paul Kosgei will attempt to do so. Makau is third on the all-time list with 58:56, and Kosgei, sixth all-time with 59:07, is eager to return to top form after two years affected by injury. "I'm going well, and I have no problems" said Kosgei. No running problems, that is. He has not been back home to Eldoret for a while because of the murderous riots there – in the heartland of Kenyan running – following the disputed national elections. Several athletes have been threatened or injured, and former Olympian Lucas Sang paid the ultimate price. The unrest has certainly caused problems for some of the leading contenders for the women's race in RAK, as the tiny Emirate is called locally. 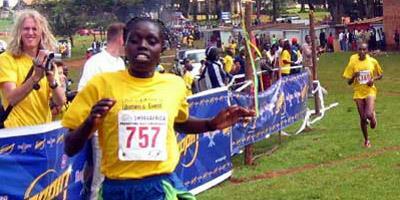 Pamela Chepchumba, whose home is in Eldoret says, "I have had to drive as far as 100km away to train in peace. I am only doing about 45% of my usual training, because of the problems". Alice Timbilil lives 40km from Eldoret, and she too is being cautious. Her husband and training partner, Mark Sinyei is injured but "he follows me in the car when I run now. It is awkward, we can train only from our home, and I am not doing as much training as before". They are co-favourites for the $25,000 first prize, from an overall prize pot of more than $200,000 - which the organisers say makes RAK the world's richest half-marathon. Three AIMS events were scheduled in Japan on 3 February: the Kagawa-Maragume Half Marathon (more), the Beppu-Oita Mainichi Marathon (more) and the Ohme-Hochi 30km road race (more), although the last of these was cancelled due to heavy snow. The Osaka International Ladies' Marathon (more) in Japan and the Khon Kaen Marathon (more) in Thailand took place on 27 January. At an official reception hosted by the Berlin government and the city's sports organisation leading representatives of AIMS presented a cheque for $10,000 to the Berlin Sports Museum, which is also the official AIMS Marathon Museum of Running. The donation will enable the Museum's exhibition space to be extended. The Tiberias Marathon (more) (ISR) was held on 10 January. Next on the Calendar (with nothing scheduled for the weekend of 12/13 January) is the Standard Chartered Dubai Marathon (more) on 18 January. The Cabo Marathon (more) in Mexico took place the following day, before the Standard Chartered Mumbai Marathon (more) on 20 January. Also held on that day was the Subic Marathon (more) (PHI) and the China Coast Marathon (more) (HKG). After the Berlin Wall came down various sport history collections were united in the Berlin Sports Museum, under the Cultural Senate of Berlin and then the Berlin City Museum Foundation. In 1997, the museum was established in premises at the Berlin Olympic Park and in 2003 one wing was renovated to help house the museum's 100,000 artifacts. The Sports Museum's collections help to make historical topics in sports tangible as cultural, social, and living phenomena and convey the history of sport as an integral part of human history. Traveling exhibits have been created to present the various aspects of sport to the public which currently includes a special collection on the international running movement dedicated to city marathons and road races. The Berlin Sports Museum was officially named the "AIMS Marathon Museum of Running" in 1994 at the 9th World Congress of AIMS in Macau upon the suggestion of Horst Milde, race director of the Berlin-Marathon and the Berlin Half Marathon. The museum documents the development of running and the marathon worldwide. Numerous races have provided material from their events, including the Boston Marathon, New York City Marathon, the Marine Corp Marathon in Washington DC, the Tallinn Marathon, the Prague Marathon and the Venice Marathon. For the 25th anniversary of AIMS in 2007, the museum created an 18-panel exhibit on the history of AIMS and the development of the marathon (in English), which was displayed at the 16th World Congress in Xiamen, China, and which is now on tour through the USA. This exhibit is also on display in both English and German in the Haus des Deutschen Sports in the Olympic Park. Many German Road Races (GRR) events have also provided artifacts for the museum. Included in the collection is Otto Hosse's DLV-stamp timer clock from the 1960s which makes an interesting comparison with today's transponder technology of ChampionChip, which the museum recently received. Berlin Olympic Park, Hanns-Braun-Straße, 14053 Berlin. This year Italy celebrates 90 years since the end of the First World War. The territory of Treviso, just 30km from Venice, was in the front line of the conflict, and will commemorate the event with a special edition of its marathon on 30 March. Three separate race starts (from Vittorio Veneto as usual, but also from Vidor and Ponte di Piave) will meet at around 22km in Ponte della Priula, just before crossing the River Piave. Runners at each start will be given colour coding so that a spectacular "tricolor" effect will be created at the merge point. Each course has been measured and certified to AIMS standards. After merging, all runners then follow the usual course to the finish line in Treviso where a diverse program of events will be held, all in commemoration of the Great War. Just three years after the race was founded there were 3700 finishers in last year's edition. For 2008, still three months before the race date, 4300 entries have been received. The first event of 2008, the St Croix International Marathon (more) in the US Virgin Islands, was held on New Year's Day, followed on 5 January by the Xiamen International Marathon (more) (CHN) and the Kinmen Marathon (more) (TPE), and on 6 January by the Mizuno Hong Kong Half Marathon Championships (more). Haile Gebrselassie runs the "Million Dollar" Standard Chartered Dubai Marathon on 18 January writes Pat Butcher. While his manager Jos Hermens touts the possibility of another world record, Haile himself is more reticent: "Yes, I did 2:04:26 in Berlin three months ago, but everything was perfect. It's possible to go under 2:04, but everything has to be perfect again". Weather conditions may be similar (13-15C); the similarly flat Dubai course has had some corners ironed out, and pacemakers Fabiano Joseph and Rodgers Rop are well primed - but everything yet has to come together, including the arrival of the Kenyan support act. On that score, Geb is mystified: "I don't understand. It's so sad. Normally Kenya is more democratic than the rest of Africa. It makes me feel very bad". Dubai will be his last marathon before the Beijing Olympic Games in August, an event for which he is not yet selected: "though I am top of the candidates. We'll see!". Richard Nerurkar works with Haile on development and educational projects in Ethiopia, among them the Great Ethiopian Run, and says: "Berlin taught Haile how to run the perfect marathon. He now knows the distance. But you need luck for things to work out as they did in Berlin". If approached properly, endurance running can be the best way of maintaining health and performance throughout one’s life. But if you wish to compete in a long-distance endurance event (5km, 10km, half marathon, marathon, or longer) you should be aware of the state of your health and do your utmost to avoid risks. To help you in your self-assessment you should ask yourself the following questions. If you answer “yes”, to any of these questions we would strongly recommend that you undergo a cardiological examination before starting to train or compete. Note that the amount of training you do plays a key role in your level of fitness. If you plan to compete in a half-marathon, for example, you should prepare and train accordingly for 1½ to 2 years. - Has your doctor ever warned you that you have “heart issues” or that you should only be physically active or do sports under medical supervision? - Are you overweight or underweight? - Is your girth over 88 cm (for women) or 102 cm (for men)? - Are you over 35 and been physically inactive for a long time? - Have you ever been diagnosed with high cholesterol? - Do you smoke or have you smoked extensively in the past? - Has anyone in your direct family ever suffered from high blood pressure, calcification of the coronary blood vessels/heart attack, blood sugar disease, or stroke? - In the past few months, have you had the sensation of a ‘racing heart’, problems breathing, or chest pains, whether while at rest or during athletic activity? - Are you taking any medication for high blood pressure, heart or breathing conditions? - Do you ever feel dizzy or pass out, whether at rest or during physical activity? - Do you have any problems with your musculoskeletal system, which worsen during physical activity? [* Compiled according to the current views of leading doctors and sports medical institutes in Germany].